Once a rule has been created, Cash Manager Focus searches for and recognises text in your invoice that matches a coding rule, and automatically codes it for you. 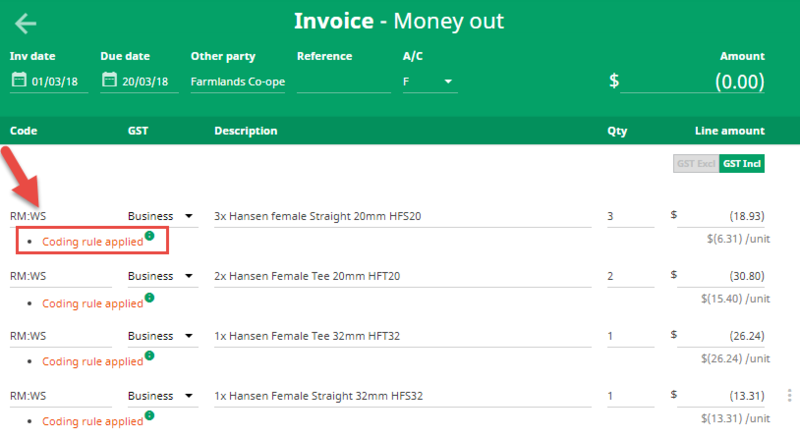 TIP: Invoice coding rules work best in the Farmlands monthly statement feed, where the statement is automatically fed into your farm business. Beth notices a large number of purchases for Hansen joiners on her Farmlands statement. Instead of coding each line individually, she can create a coding rule that will automatically code these items for her. So that the correct code is allocated to the joiner purchases, she creates an invoice coding rule as follows, using two of the four available criteria. Because Beth has created a rule with two criteria, only Hansen related purchases will be automatically coded to Repairs & Maintenance - Water Supply (RM - WS) on her Farmlands statement. The next time an invoice details information that is included in a coding rule, the invoice lines will be automatically coded for you.